You’ve almost certainly heard about the EU’s new data protection and privacy law, the General Data Protection Regulation (GDPR). The GDPR requires businesses to follow strict guidelines when they’re using personal data. It comes into effect on 25 May, and affects all businesses in the EU. It also applies to businesses in other countries outside the EU that have any dealings with EU citizens. We’ve made sure that Light Blue Software is ready for the GDPR, but we’ve done much more than simply making sure that we comply with the new regulations. We’ve also been hard at work adding new tools to Light Blue that help you to ensure that your business complies with the GDPR, and we’ve been working with legal and security experts to provide you with advice that can help you to do that. Light Blue 7.1 is out today, and it includes several new tools that can help you to comply with the GDPR. Light Blue 7.1 is a free update for everyone who subscribes to our online services, or is already using Light Blue 7. You can find out more about the changes in the Light Blue 7.1 release notes. Light Blue 7.1 also includes an updated licence agreement. The GDPR requires data controllers (i.e. you) to have a contract with their data processors (i.e. us, if you’re using our online services), and agreeing to this updated licence agreement forms that contract. You can find out more about the GDPR, how it affects your business, and how it affects your use of Light Blue in the FAQ that we have created. 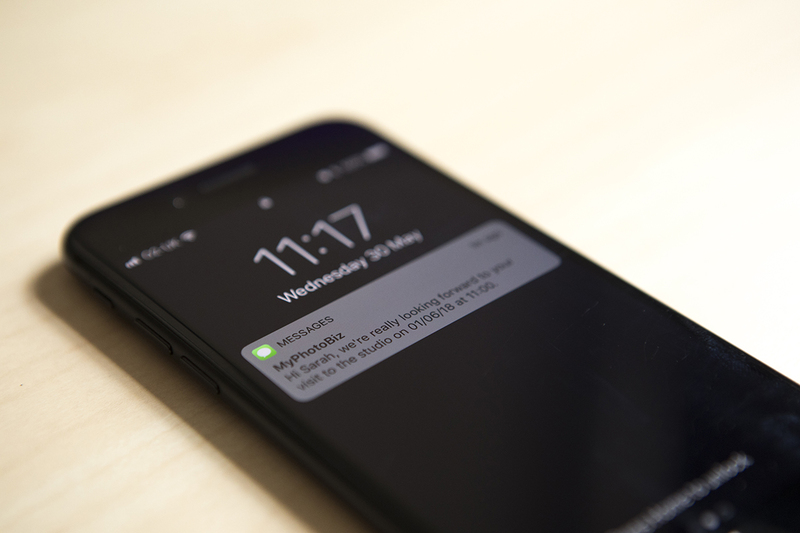 Ensuring the security of your clients’ personal data is an important part of the GDPR, so we’ve also provided advice on securing the devices you use Light Blue on. As part of the changes that we’ve made to ensure that Light Blue Software complies with the GDPR, we’ve updated our privacy notice and the Light Blue licence agreement. This updated licence agreement is part of Light Blue 7.1, and agreeing to it covers the GDPR’s requirement for data controllers to have a contract with their data processors. We take the security of your personal data, and your clients’ personal data, seriously. That’s why we’ve been working hard to prepare this document for you to help you prepare for upcoming changes in privacy law, when the GDPR comes into force on 25 May. If you’re already complying with the current data protection laws in the UK (the Data Protection Act), it’s likely that you’ll only need to make a few changes to ensure you’re complying with the new law. We’ve had a number of questions from photographers in relation to the GDPR, and so we hope this FAQ is helpful to explain how your use of Light Blue affects your responsibilities under the GDPR. The law dealing with the way in which people handle personal data for commercial purposes is changing. The General Data Protection Regulation (GDPR) will come into force on 25 May 2018 and you need to be ready to comply with the new rules from that date. The GDPR is designed to ensure that people are transparent in their processing activities and when they communicate with data subjects (i.e. your clients). Yes, it’s likely that it will apply to you (and most other businesses in the UK and EU). Data protection laws apply to people who, for commercial purposes, handle ‘personal data’ – which means any information that can identify a living person. By managing your clients, enquiries and bookings, you are handling their ‘personal data’. Is Light Blue Software GDPR-ready? Yes. We’ve taken various steps to ensure that we’re ready and compliant. For example, we’ve updated the privacy notice on our website and updated the Light Blue licence agreement to cover the new regulations. If Light Blue Software are ready and GDPR compliant, why do I need to do anything? The GDPR distinguishes between the roles of a data processor and a data controller. Light Blue Software is a worked solution used by you to provide a service to your clients. Where Light Blue Software receives information about your clients (e.g. name, address, a photo), Light Blue Software is just a data processor acting on your behalf. You are the data controller. That means the primary responsibility of the GDPR rests with you in relation to your client. However, Light Blue Software has taken steps to help you comply with the GDPR: for example, by adding new GDPR clauses to our licence agreement with you which deals with our processing of your clients’ data. Light Blue Software will be the data controller in respect of the information we hold about you (our customers) for billing, management, and administration. For more information about how we collect and use your personal data, see our privacy notice. In relation to your use of Light Blue, you need to be clear and transparent about your use of a third party processor. Do I need to tell my clients about Light Blue? Yes, transparency is key under the GDPR. You must inform your clients about the collection and use of their personal data. What’s the best way to inform my clients that I use Light Blue? You can update your website privacy notice. Under the GDPR, you’re only required to say that you’re using an externally hosted third party to enable you to provide your service, rather than name Light Blue specifically. Will I need consent from my clients to enter their details into Light Blue? Some aspects of the GDPR are unclear at the moment, but we’ve been working with legal experts and they don’t expect you to need consent from your clients to manage their personal details with Light Blue. Another legal basis for processing (that’s likely to apply here) is that it’s in the legitimate interest of your clients for the administration of their account. How long can I retain my clients’ data in Light Blue? Under the GDPR, personal data shall be “kept in a form which permits identification of data subjects for no longer than is necessary for the purposes for which the personal data are processed”. This means that you can retain your clients’ information whilst you provide the services to them, plus a reasonable period after that. As part of Light Blue 7.1, we’ve introduced a new tool that can help you to identify personal information that you no longer need to keep so that you can securely delete it. You can find out more about this tool (and the other new features that we’ve added to Light Blue to help you comply with GDPR) in the Light Blue 7.1 release notes. Will my clients’ personal data be kept secure by Light Blue? Yes. We take extensive precautions to secure every aspect of Light Blue’s online services, including (but not limited to): encrypting all communications between the Light Blue desktop and mobile apps and our servers; encrypting data at rest on our servers; securing our servers according to industry best practices. Because Light Blue stores a copy of your data on the devices that you use it on so that you can use it when you don’t have an internet connection, you should take precautions to ensure that no-one has unauthorised access to your own copies of Light Blue. We’ve provided some helpful tips for securing your copies of Light Blue on our blog. Where does Light Blue Software store my clients’ personal data? If you’re using our online services, we store a copy of the current version of your data on our servers. Our servers are located in the EU, and we ensure that the providers that we use are compliant with the GDPR. This is not a substitute for legal advice. You are responsible for your own compliance with data protection laws. This is guidance only and is based on normal use of Light Blue Software products. You’ll need to seek your own advice. Light Blue 7.1 adds new features to Light Blue 7, and is a free update for everyone who’s subscribed to our online services or is already using Light Blue 7. GDPR is an update to the data protection laws throughout the EU. 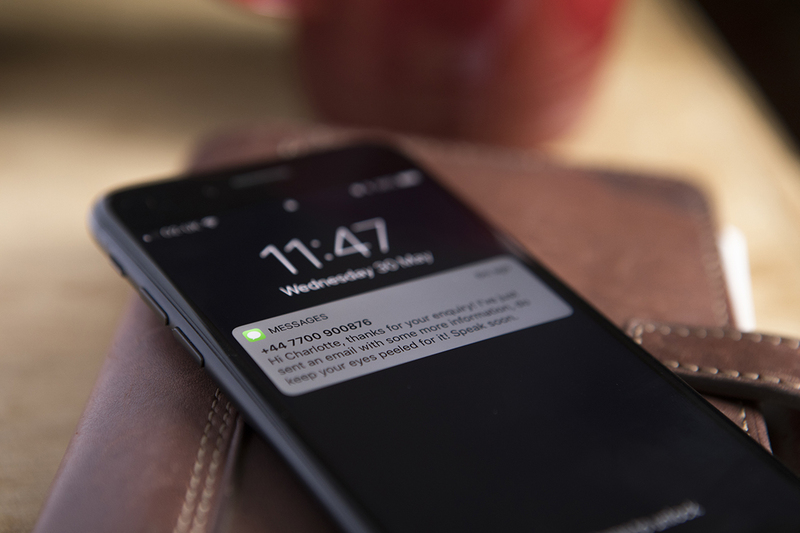 Light Blue Software already complies with GDPR, and we’re adding some features to Light Blue 7.1 that can help you to comply with it in your own business. Updated licence agreement: GDPR requires data controllers (i.e. you!) to have a contract in place with their data processors. Agreeing to the updated licence agreement that comes with Light Blue 7.1 forms this contract. 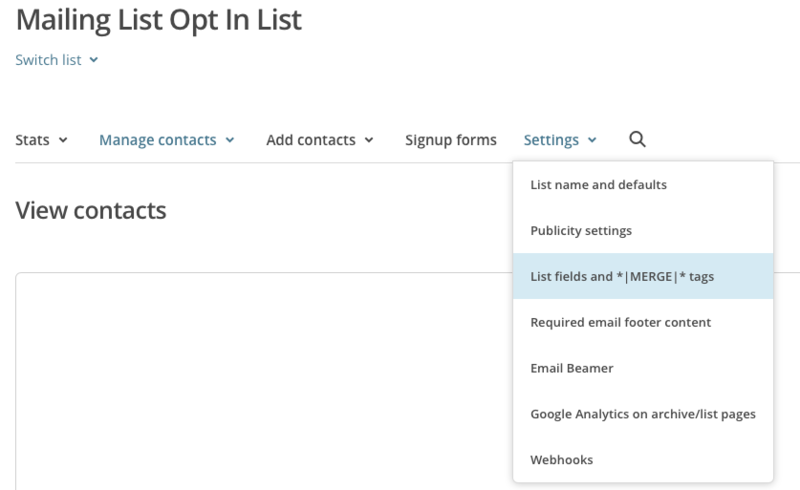 You’ll find a command in the Housekeeping section of the Records menu that allows you to set the mailing list opt-in checkbox for all of the contacts in your found set. 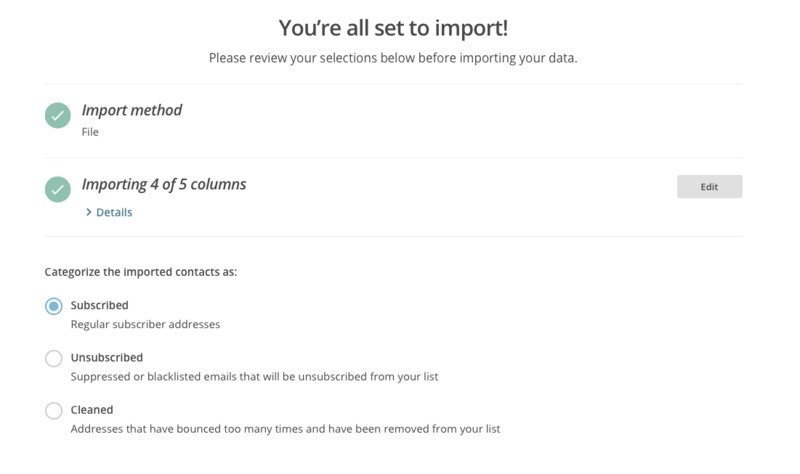 If you decide to remove all of your existing clients from your mailing list so that they will need to opt in again, this tool allows you to do that quickly and easily. 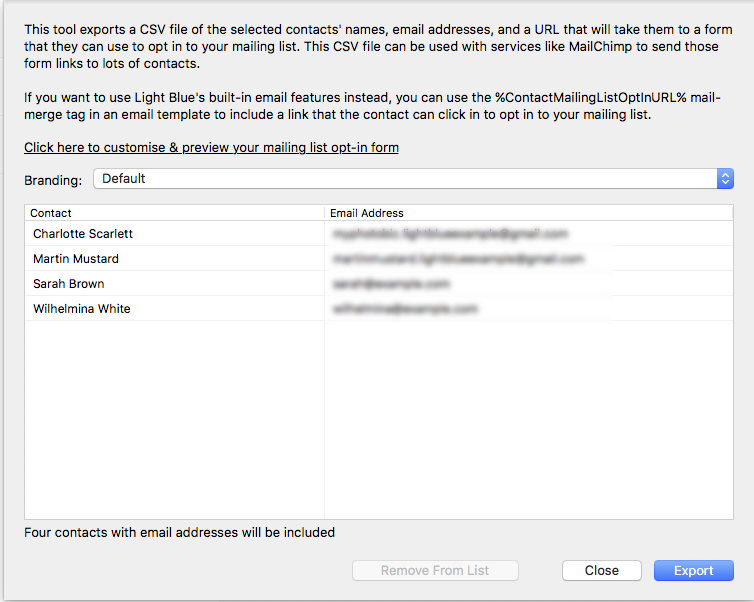 When you tick the mailing list opt-in checkbox, Light Blue now presents a dialog that allows you to record the date and reason for this. When someone opts in by checking the relevant box when filling in one of your forms, this is automatically recorded for you. 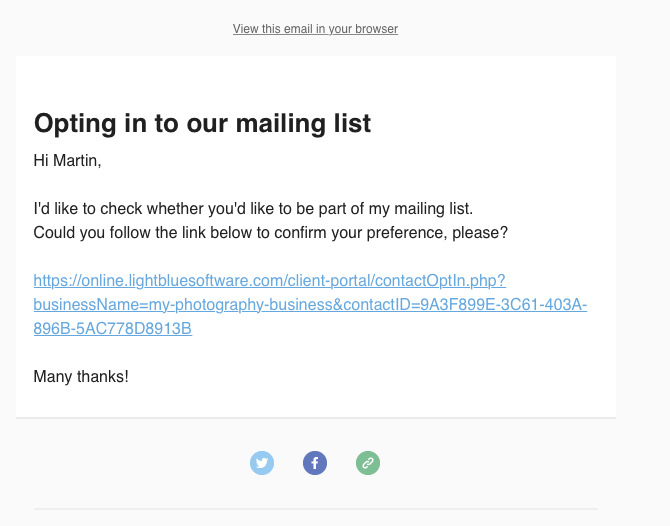 The mailing list consent details are included in Light Blue’s built-in contact details printing template. 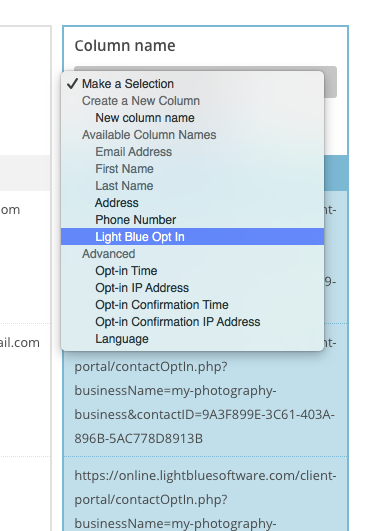 You could already include a mailing list opt-in checkbox in the contact fields in Light Blue’s forms, but we’ve now added an alternative mailing list opt-in checkbox that you can include anywhere in your form that will allow your client to set this opt-in for all of the contacts on that form. You can also include more explanatory text with this checkbox, to ensure that your clients understand what they’re doing. Including booking forms in your contract PDFs: You could already choose to include your booking form as part of the contract PDF that’s sent to you and your clients once they’ve signed their contract, but we’ve made this setting easier to find and more flexible by moving it into the ‘Advanced Options’ section of the contract template. You might find this particularly helpful if you’re asking clients to opt into your mailing list as part of their booking form, or if you’re including other checkboxes that are relevant to your contract as part of the form. You can now include checkboxes within the text of contracts: You can now have checkboxes within the text of a contract in Light Blue. When you’re editing a contract or contract template, you can use the ‘Insert Checkbox’ button to add optional or required checkboxes. Required checkboxes have to be ticked by your client before they can submit a signed contract. 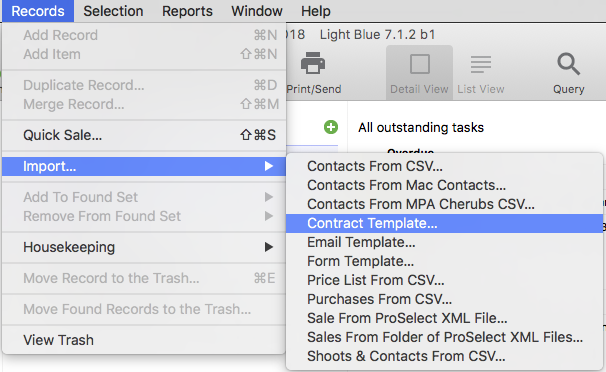 When you are accepting a signed contract from the Inbox, or viewing a signed contract from the Activity panel of a shoot, any checkboxes that you included in the contract are listed for you to make it easy to see which options your client chose. Including checkboxes within the text of your contract could be helpful if there are specific terms that you want clients to acknowledge, or options that you want to give them. 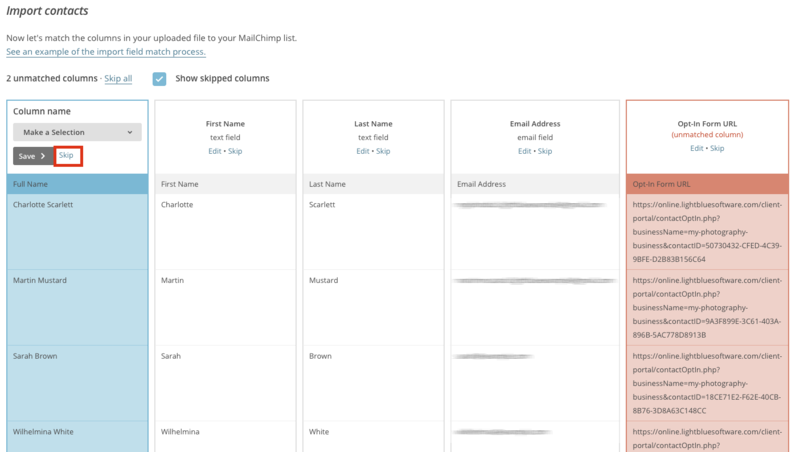 For opting into receiving marketing communications, we would recommend using one of the mailing list opt-in options that are available as part of the booking form instead of a checkbox in the contract text, because using one of our ‘official’ options will automatically set the appropriate fields on your clients’ contact records in Light Blue. If anyone has any questions about including checkboxes in their contracts, or needs any help setting them up, please let us know and we’d be delighted to help! 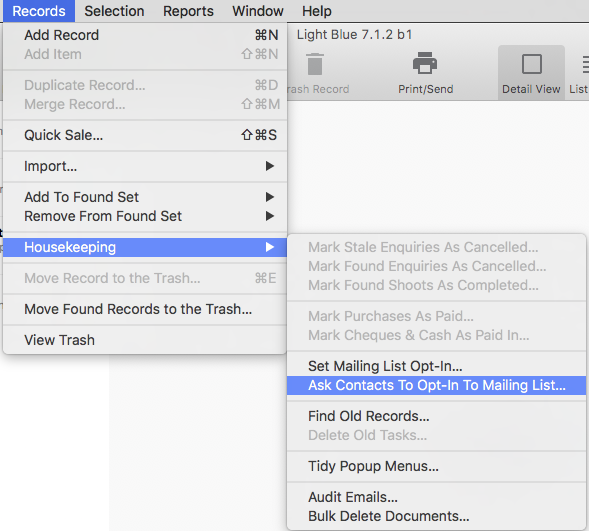 Identifying old personal data that can be removed: We’ve added a tool to the Housekeeping section of the Records menu that allows you to easily identify old records that you might want to remove from Light Blue if you can no longer justify holding the personal data that the contain. The ‘Find Old Records’ command allows you to specify which types of record you’re searching for, and how many years back you want to go. 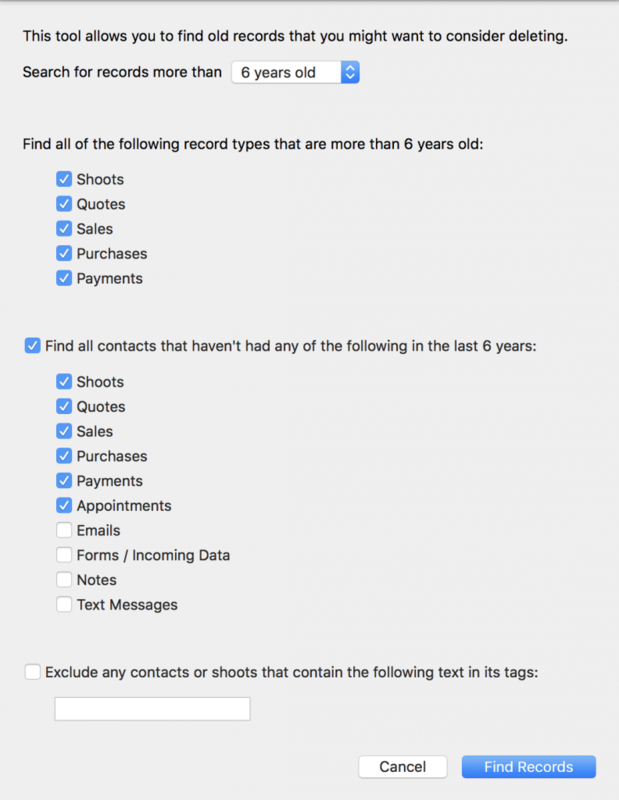 For example, you could search for all contacts that haven’t had any shoots, appointments, or sales within the last 6 years (or whatever you decide is reasonable). Once you’ve found these old records, you can check them carefully and then use the ‘Trash Found Records’ command to delete them. Providing clients with a copy of the information that you hold about them: We’ve added a ‘Linked Records’ option to the list of optional extras when printing contact or shoot records. This is particularly helpful if you ever need to provide a client with a copy of all of the personal data about them that you hold, because printing a contact record with this option enabled will print both their contact details and a list of all related pieces of information. Reduced information option in calendar feeds: Light Blue 7 added a ‘Show Only That I’m Busy’ mode to calendar feeds, but for situations where you want to give someone a bit more information about what you’re doing but don’t want to give out any personal data about clients we’ve now added a ‘Title & Location Only’ mode. That’s the end of the GDPR-specific changes we’ve made in Light Blue 7.1, but read on to find out more about the other features and bug fixes that we’ve added. When you export a contract template, you can now include that contract’s booking form as part of the same export file. 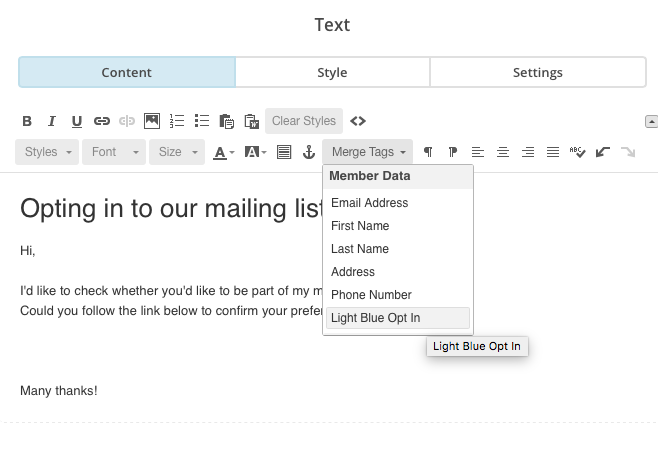 This makes it easier to supply a booking form and contract to other photographers, who can import these templates into Light Blue 7.1 in just one step. The emails that we send on your behalf when a client is working through a form or contract are now optional. 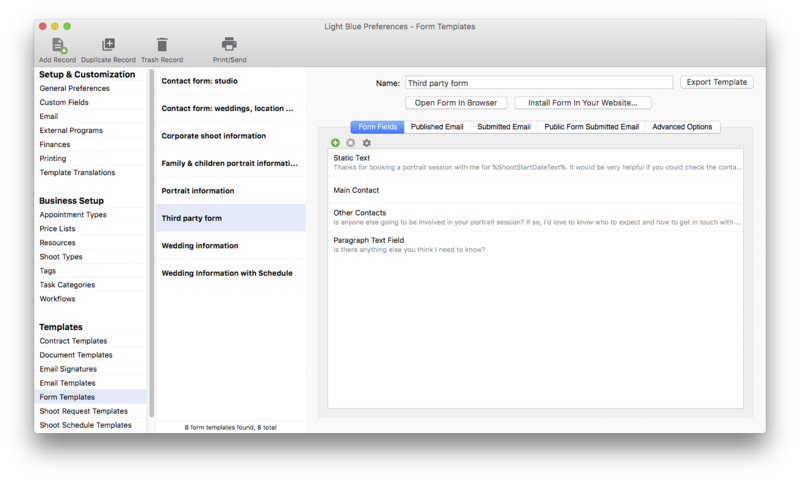 Contract and form templates now have checkboxes that allow you to choose whether an email is sent when it’s published, submitted, etc. Miscellaneous checkboxes and popup menu choices from a booking form are now included in the contract PDF. When displaying a checkbox value from a form, we now display it as “yes” or “no” (or your localised equivalent) instead of “1” or “0”. When a form that contains hidden fields is submitted, the email that’s sent to you and your client no longer includes those hidden values. 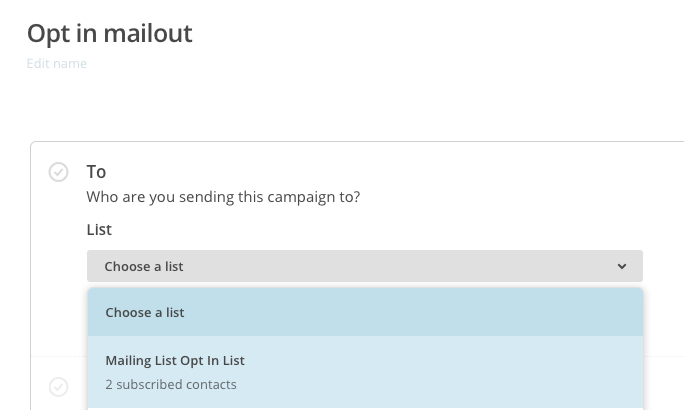 Fixed a problem where the “no contacts” warning could be displayed when setting up a contract or form and you have deselected the existing contacts. Fixed a problem where a blank Purchase record could be created when accepting a contract with a booking fee that was paid offline. Fixed a problem with editing contracts where, if a paragraph ended with italic text, an asterisk could be added to the end of the paragraph. We’ve rewritten the way that Light Blue interacts with macOS calendars and reminders. While you shouldn’t notice any changes in the way that most of these features work (apart from loading macOS calendar events into Light Blue’s calendar being much faster! ), we have had to disable the old feature where ticking off a Light Blue task from the Reminders app would tick that task off in Light Blue as well. 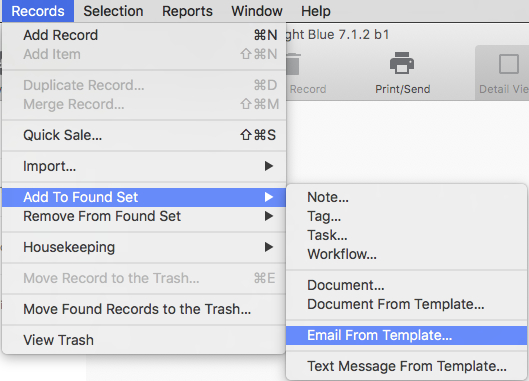 Do please let us know if you have any feedback about these changes to how Light Blue works with macOS calendars and reminders! We’ve added reply buttons to emails that have been sent from Light Blue (you could already reply to emails that you’ve received). 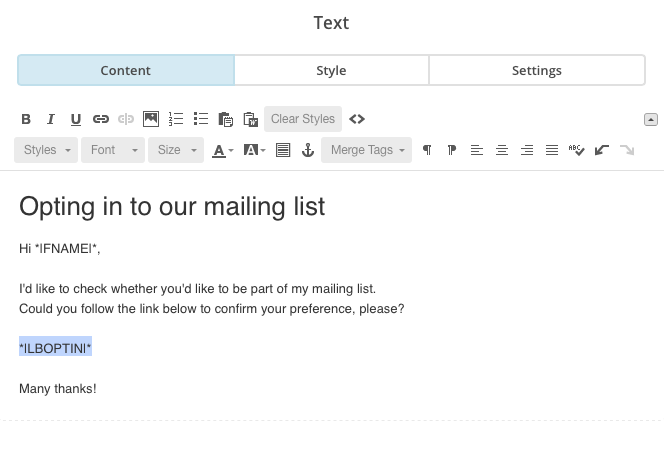 When editing an email template, the plain text version that’s automatically saved at the same time now has its paragraph spacing formatted to more closely match the HTML version. Fixed a problem where creating an email to the found set in Mail would only create an email to the first contact. We’ve improved the speed of loading large numbers of shoots. If you’re using a proxy server, we now encrypt the password. Added a ‘Reassign’ command to the Task Manager options menu, which allows you to reassign all of the selected tasks to a different member of staff in one go. Added a ‘Business Address’ field to the ‘General Preferences’ section of the Preferences window, and a corresponding %BusinessAddress% mail-merge tag. Fixed a problem with the capitalisation of some types of activity when included in shoot or contact printouts. 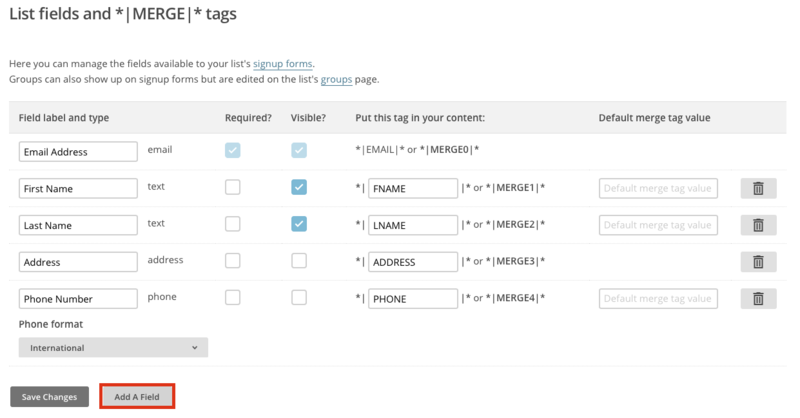 It’s now easier to query for shoots that have a particular tag, because we’ve added a calculated tags field (in addition to the existing option of querying the linked tags). 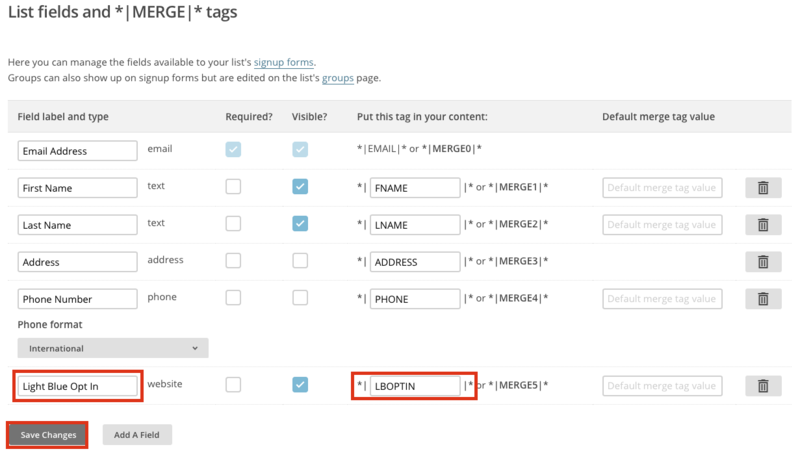 We’ve also added a %ShootTags% mail-merge tag. Added a “Warn If Invoice Is Older Than Other Invoices” option to the ‘Finances’ section of the Preferences window. This allows you to enable or disable the warnings that appear when you try to create an invoice, but already have invoices with dates that are ahead of the one you’re trying to use. 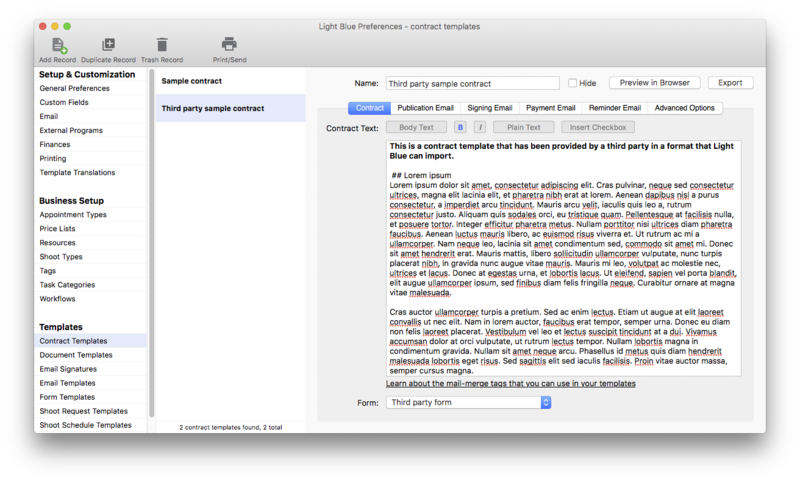 Added ContactMailingList, ContactVATNumber, and ContactNameMaiden parameters to the Light Blue API. Fixed a database error that could occur when running an income and expenditure or tax report. Changed the way that duplicated records are named from “Duplicate of ‘original record name'” to “Original record name copy”. The quick search box now includes a wider selection of fields in its queries, including quote descriptions and the net and gross totals of quotes, sales, purchases, and payments. 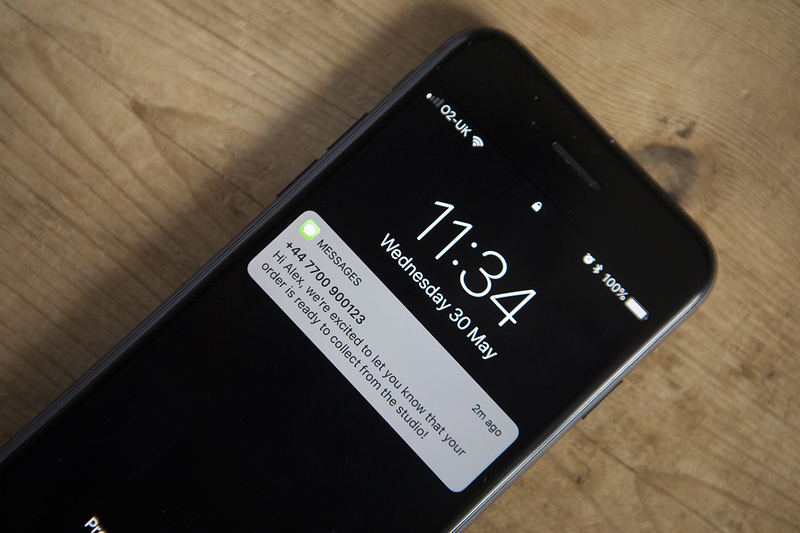 When linking a received text message to a shoot, Light Blue is now a bit smarter about linking to an existing contact instead of offering to create a new one. 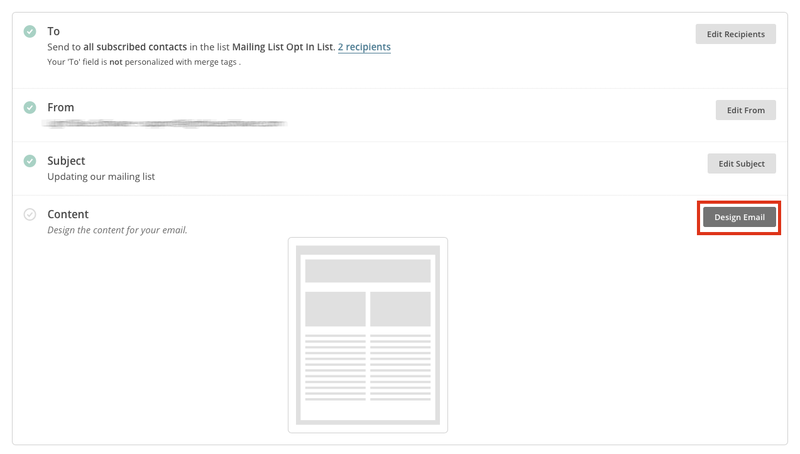 Added an “Update Linked Contact’s Address” command to the contact fields on quote, sale, purchase, and payment records. You can use this to update the linked contact’s address if you’ve added or edited the address from a quote, sale, purchase, or payment. When you’re editing a text message template, you’re now given an estimated number of parts for that message. The number of parts can obviously change if you include mail-merge tags in the template, because the mail-merge tags will be replaced by real data when you use the template. Fixed a problem where, when creating a task from the Home screen and trying to link it to a Quote or Payment record, the search box didn’t work properly. Fixed a problem where, when using a date filter for the Task Manager other than ‘All Outstanding’, going to the linked record from an un-dated task could sometimes take you to the wrong record.